August 30, 2017 (KHARTOUM) – The European Union welcomed the released of Mudawi Ibrahim Adam a Sudanese human rights defender and five other activists following a presidential pardon on Tuesday. «The presidential pardoning of six Sudanese human rights activists, including Dr Ibrahim Mudawi and Hafiz Idris, detained since December 2016, is a step in the right direction,» said the Spokesman of the European Union High Representative/Vice-President Federica Mogherini on Wednesday. «The European Union expects this to be followed by further steps allowing for an opening of the political space and reinforced respect for fundamental freedoms and human rights in Sudan,» the statement further reads. Adam who is an engineering professor at the University of Khartoum (UoKH) was accused of espionage and intelligence activities in favour of foreign embassies, undermining the constitutional system and waging war against the state. All of these charges carry either the death penalty or life imprisonment. Abdel Malik Hamid, UoKH spokesman said Wednesday that «the release of Dr Mudawi was in response to the request of the University administration», pointing they were working on this file with the Sudanese presidency. Also, in a statement released on Wednesday Sarah Jackson, Amnesty International’s Deputy Regional Director for East Africa, the Horn and the Great Lakes welcomed the release of the Sudanese prisoner of conscience. “Dr Mudawi’s eight months in prison represent a grave miscarriage of justice and his release must serve as a first step towards ending the criminalization of human rights work in Sudan. The authorities’ relentless assault on any form of criticism endangers anyone who dares to speak out, and it must stop,” Jackson said. The European Union, in its statement, encouraged the Sudanese government «to progress further towards national reconciliation and international cooperation», expressing readiness to support such efforts. Last May at the end of a visit to Sudan, the United Nations independent expert on the situation of human rights in the Sudan, Aristide Nononsi s expressed concern over detentions of civil society activists and called for the release of Adam. 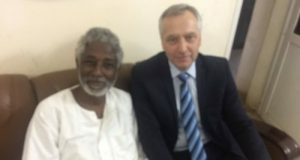 “I’d like to urge the Sudanese authorities to release Dr Mudawi Ibrahim and Hafez Idris, whom I believe have been held solely for legitimate actions to protect and promote human rights in Sudan,” he said.